Bring a large pot of salted water to a boil. Clean and thinly slice mushrooms. In a large frying pan, heat olive oil and garlic over medium heat. When garlic begins to color (about 5 minutes), add oregano and parsley; cook 1 minute. Add mushrooms and sprinkle them with a pinch of salt to exude its juices. Cook about 7 minutes. Stir in vegetable broth and cook 8-12 minutes, until mushrooms are soft and cooked brown. 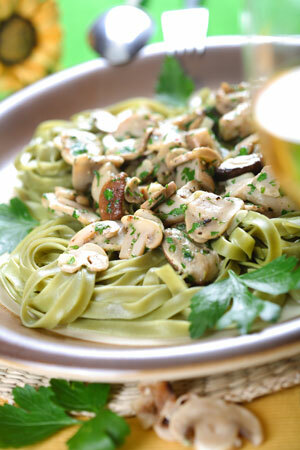 While mushrooms are cooking, prepare pasta per package directions and drain. Season mushrooms with salt and pepper, to taste, and serve over pasta. Makes 2-4 servings. Published on February 28, 2019 in Entrees.